A warm and inviting source of world-class live jazz in Columbus is coming to an end in the next month as Becky Ogden has announced the last shows at Bungalow Jazz. Longtime music educator, venue owner, promoter and presenter Ogden is selling the “Bungalow,” her 1910 East Columbus residence. 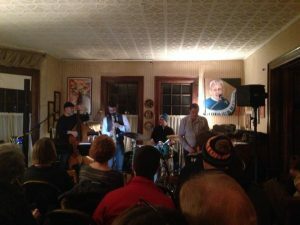 Ogden has run the Bungalow Jazz series out of her home since her Columbus Music Hall closed in 2008, offering intimate “house party” performances by excellent local musicians and renowned touring artists as well. The final five concerts on the schedule present a hearty roster of Columbus (and slightly beyond) greats that have been regular features at the Bungalow through the years: a quintet led by saxophonist Pete Mills, the Dave DeWitt TRio, the Bobby Floyd Trio, an appearance by Cincinnati vibraphonist Rusty Burge (with Mark Rubinstein and the legendary Jim Rupp), and a final concert and party featuring the Tony Monaco Quartet (with Randy Mather, Derek DiCenzo and Aaron Scott). Full schedule and lineup details are below. A request to our readers: I would like to hear your stories about concerts you’ve seen at the Bungalow. Please send an email here with your memories of Bungalow Jazz shows, which I hope to compile for an article (or articles) in the near future. While Ogden remains active with PBJ & Jazz and other educational programs through the Jazz Arts Group’s Jazz Academy, I’d like to honor her contributions to Columbus jazz education and entertainment with the words of her fans and friends at the end of this era. Thanks for sharing, and hope to see you at these shows! And thank you, Becky, for your ongoing contributions and commitment to Columbus jazz! Admission: A donation of $20 is requested at the door, all of which goes to the performing musicians.